We can't all read everything, and often, some terrific novels slip through the cracks. 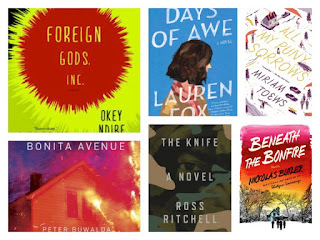 Here are six I was lucky enough to catch this year — all that didn't get nearly the recognition or readership they deserved. If you're looking for a diamond in the rough, check out any of these six fantastic books. Days of Awe, by Lauren Fox — This great novel about grief cracks my list for a couple of reasons: 1) It's one of the funnier sad novels I've read in a long time, and 2) It takes place in Milwaukee — which gets it many bonus points in my book! This is a hip, modern story about adult friendships tested by tragedy — and it packs rather the emotional punch. Fox is a smooth, witty, smart writer. The Knife, by Ross Ritchell — Ritchell, who is a former special forces soldier, writes his debut novel about special forces troops operating in "Afghanipakiraqistan" — the nebulous theater of war these days. It's an ultra-authentic-feeling war novel, but what I liked about it most is that it really gets to the heart of the moral dilemma some soldiers wrestle with regarding killing and death. The novel is also pitch perfect in terms of capturing the camaraderie of soldiers at war. If you're a fan of modern war novels, give this one a shot. And if you liked the movie Zero Dark Thirty, there's a good chance you'll dig this too. Beneath the Bonfire, by Nickolas Butler — This terrific collection of short stories will also be on my overall "Best of 2015" list (stay tuned). Butler's follow-up to his novel Shotgun Lovesongs, which was also one of my favorite books of last year, definitely cements his place as a must-read writer for me. He's really terrific, and if you liked Shutgun Lovesongs, you'll love this collection, too — the setting (rural and small-town Wisconsin) and characters are rather recognizable. Bonita Avenue, by Peter Buwalda — Almost nobody read (or has even heard of ) this crazy Dutch novel about a terribly dysfunctional family. But if you're a sucker for a story about bad things happening to bad people as a result of making really, really bad decisions, this is a novel for you. Part Philip Roth (sexual deviance), part Jonathan Franzen (dysfunctional family), part Coen Brothers (violence! ), but all grouchy Dutch! All My Puny Sorrows, by Miriam Toews — I read this for a book club, and wasn't expecting to enjoy this tale of sisterhood, one of whom is desperately depressed, as much as I did. It was a tough read at times, not pulling any punches in how it treats the issue of suicide. And the questions it makes the reader consider aren't easy either: What would you do if someone you loved simply didn't want to live anymore? But ultimately, it feels complete and profound, and with characters who stay with you.